Start Date - If you are creating your tournament days or weeks ahead of the actual play date, choosing the correct start date may have an affect on how your invited tournament players will be allowed to access their tournament round(s). If you as the organizer of the tournament are planning to control the adding/removing of players from teams, then choosing the actual start date of your tournament or just leaving it as the date of the tournament creation really does not matter. On the other hand, if you are creating a tournament where team captains will have the permission within the app to add/link players to their team, you'll want to make sure you choose the actual true start date of your tournament, otherwise they may have the ability to start their tournament round early or before you wish. End Date - The end date marks the conclusion of your tournament. After 11:59PM your local time of the end date you choose here, this tournament will move out of your Live & Upcoming Tournaments section and move down to the Tournament History section. Remember that if a tournaments end date has passed and it is listed in the Tournament History section, you will have no access to the invitations tab, team assignments tab, or ability to edit scores. In the case of a weather delay or other special circumstance that pushes back the date of your tournament, after you finish the setup process and you are in the Tournament Management side, you will be able to edit the originally chosen End Date within the Settings tab. You will want to be sure to do this before 11:59PM your local time on that day to prevent from being locked out of the majority of the Tournament Management functionalities. Enter the Pre-tax entry fee. The minimum is $5.00. Member vs Non-Member: You have the choice to enter a different entry fee for League Member vs Non-Member. Enter your Tax Rate. 18Birdies cannot legally provide you tax advice. Please consult a tax advisor to determine if the event you are running requires you to charge a tax rate, and what rate to charge. 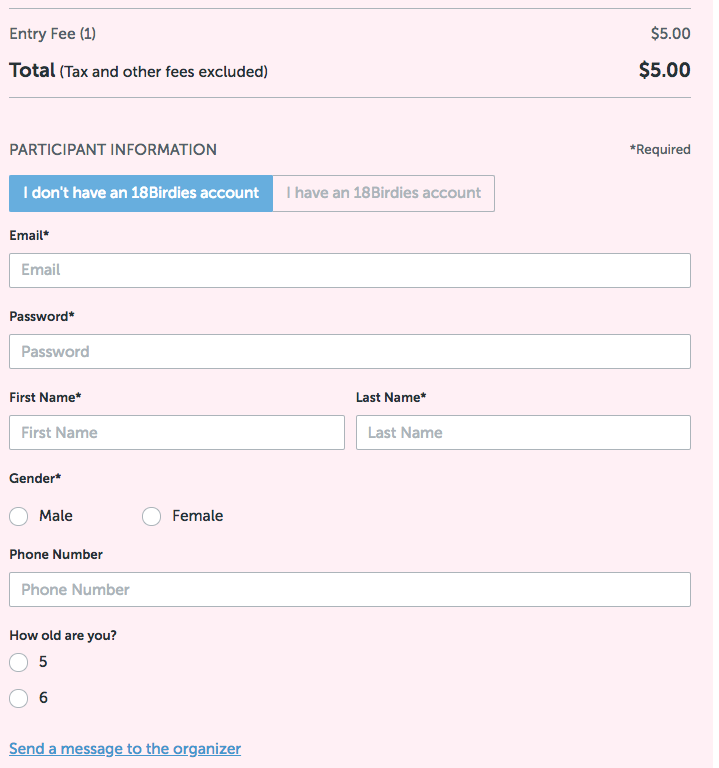 (Optional) - Set a Group Discount (only available in Events): You have the ability to allow users to sign up a group of users to your Event. 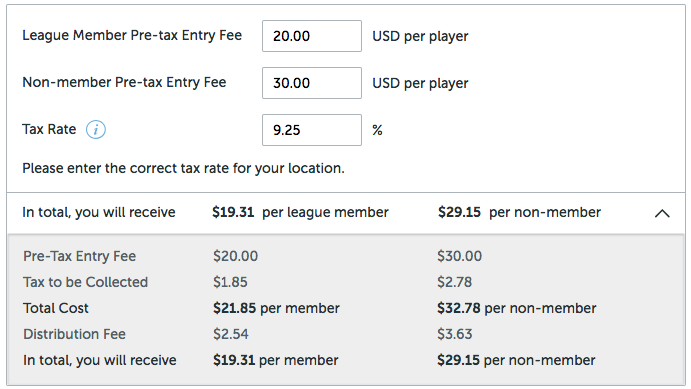 To do so, enter the number of players one user can purchase at a time, and what the pre-tax fee you'd like the group to pay. 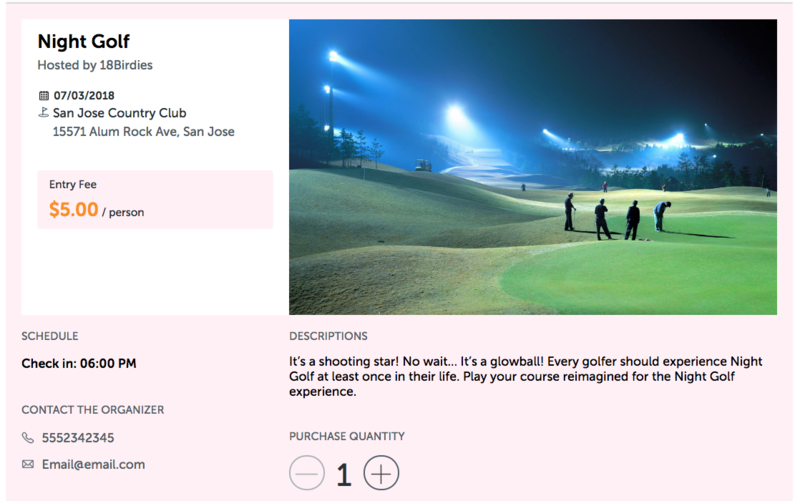 For example, if your event is $10 per player, you may want to offer a $1 discount if a group of 4 signs up. So you would enter 4 players and pre-tax USD would be $36. Choose the Pricing Details drop down menu to view what app users will see when they register for your event. This will show you what the Total Cost will be to each registrant, as well as what you will receive after the distribution fee is collected. By NOT choosing this option, you are allowing Non Members of this league to join the tournament. 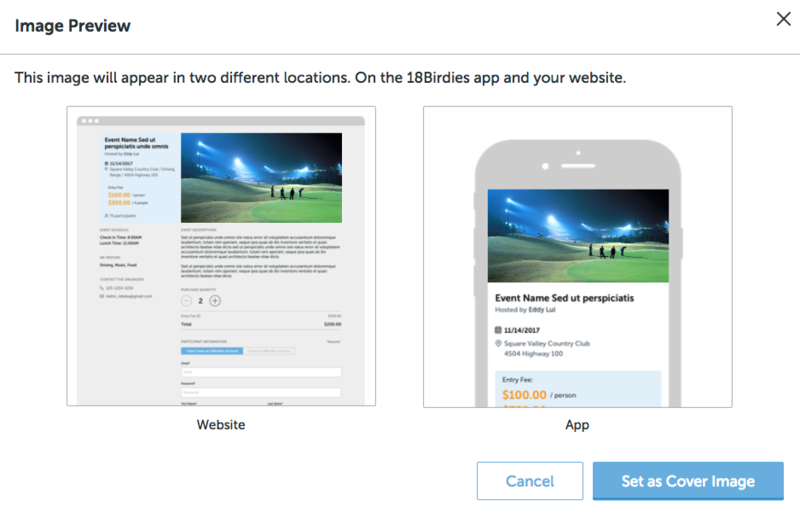 Keep in mind that you are setting up a LITE tournament, and app users will not see this tournament as available to them in the 18Birdies app, so unless you send a user an invitation, they will not have the means to join the tournament. Here is where you'll want to enter a few words or sentences about the Tournament you are creating. Here is where you as the Tournament organizer have the ability to choose a photo or photos that will be used to market your Tournament. You will first see one default image. Hover your cursor over the image to either (1) Preview the image to see how it will appear on the registration website and on the 18Birdies app registration page, or (2) Trash the image by choosing the trash can icon. Simply click the empty photo square to upload an additional photo to the Tournament images. The green border around the default image indicates that is the image that will be displayed as your cover page image. Hover your cursor over new images you've uploaded to set a new cover page image. Enter the phone number and email address that you'd like displayed on the registration website for registrants to contact you. Some Tournaments you create may have limited space. If you wish to limit the number of participants for the Tournament, simply enter that maximum number here. Choose Next when you are ready to move on to the next step. The Gain Intelligence portion of the Tournament Max setup process is to allow you the opportunity to learn some specific details about the event registrants. 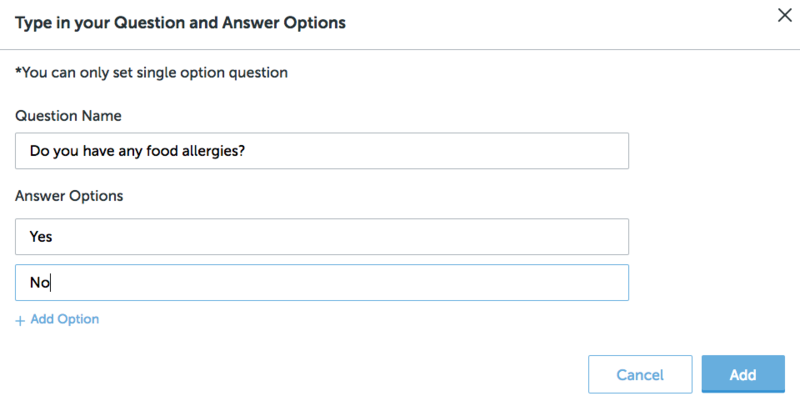 The questions you ask your registrants will be required to be answered in order for a new user to complete the registration process. Examples below. To complete the Tournament setup for a Max Tournament, follow the directions detailed in the Creating a LITE Tournament in Leagues article. The Preview page is simply a look into what the Tournament registration website will look like to the folks you send an invitation to. You will see the title of the Tournament, date, club, address, cost, etc. 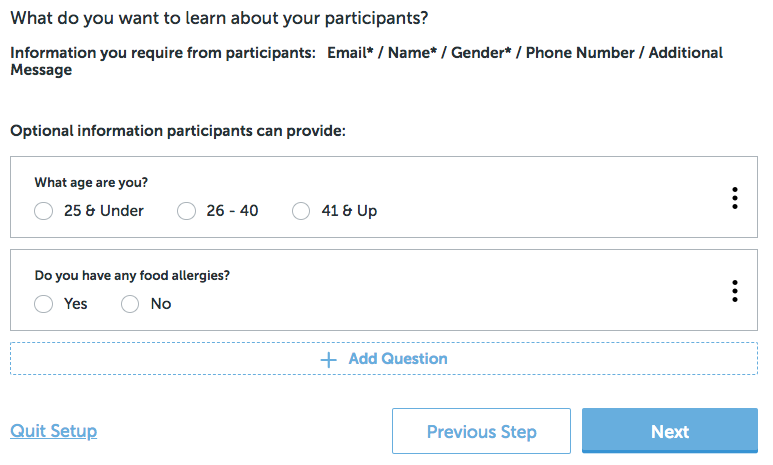 This is exactly what app users will see in the app as well as invited participants on the web-based version of the registration page. When you are ready to complete the setup of your Tournament, choose the option Create My Tournament Now.